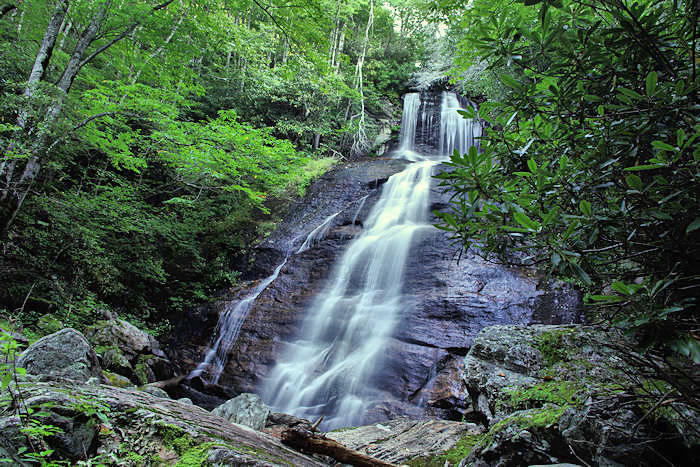 There are several great waterfalls along NC Highway 215 (Forest Heritage Scenic Byway) that runs between the Blue Ridge Parkway and US Highway 64 through Pisgah National Forest. 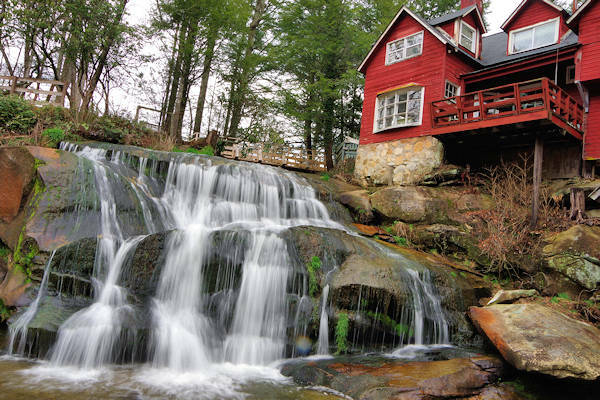 At this stop, you'll see four waterfalls and cascades along a riverside hiking trail at the religious retreat named Living Waters in the Balsam Grove community. Visitors are welcome to see the falls, and there is some room for roadside parking at the signs that say "Private Property, Enter at Own Risk." To the left of these signs is a short trail that leads to the riverside trail. It's a heavenly walk for waterfall lovers and easy for all to enjoy. 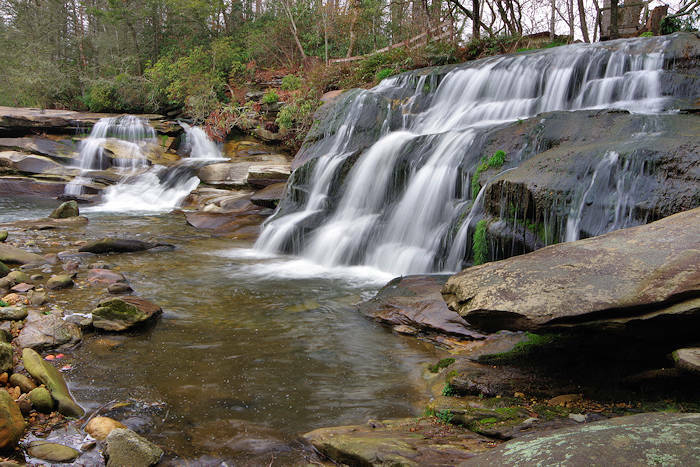 After reaching the trail by the river, walk a few steps to the right to see a gorgeous twin waterfall featuring French Broad Falls and Mill Shoals (also called Shoal Creek Falls), both about 15 ft. high. This is the intersection of the north fork of the French Broad River and Shoal Creek. There are boulders to sit on to soak in this beautiful setting by an old mill that is now part of the retreat. After rain, the waterfalls are even more impressive! 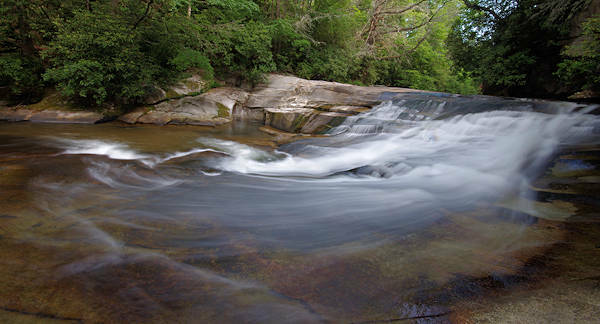 From the twin waterfall, turn around and follow the riverside trail downstream to see more cascades and Cathedral Falls. There are several side trails to the right for picnic spots and up-close views of the rushing water. Walk about 1/4-mile downstream to Cathedral Falls (also known as Bird Rock Falls), a small 15-ft. waterfall by a towering rock cliff. See our Cathedral Falls Guide. From US Highway 64 near Rosman: Drive NC 215 North about 7.5 miles. Look for the parking pull off on the left just before the Living Waters sign (look for the "private property, enter at own risk" signs). From the Blue Ridge Parkway: Drive NC Highway 215 South about 9.2 miles and park on the right just beyond the Living Waters sign. It's about 50 miles from Asheville. GPS Address: 7935 Parkway Road, Balsam Grove, NC. 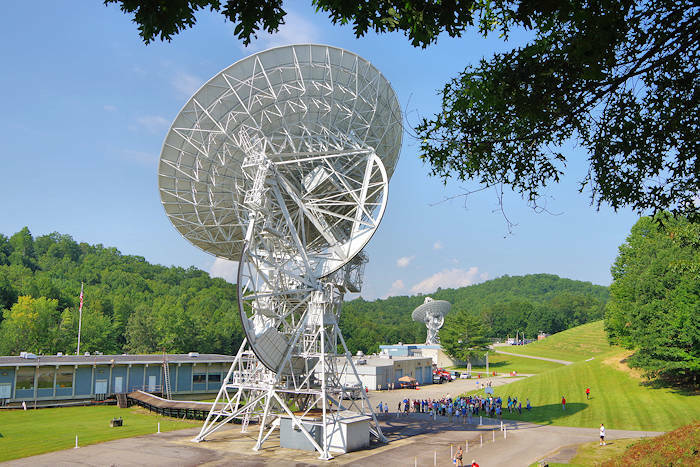 PARI (Pisgah Astronomical Research Institute) is just a few miles away and is a must-see for any space or science lover. Read more. 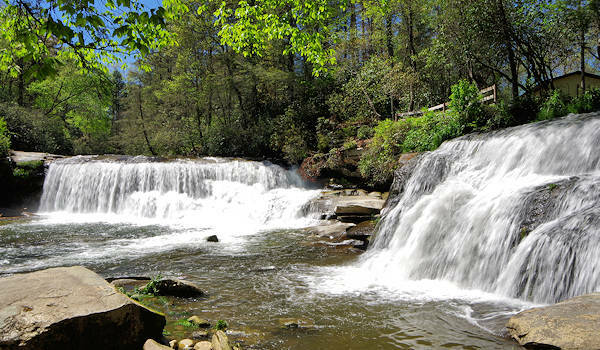 About six miles away north on NC 215 is Courthouse Falls. 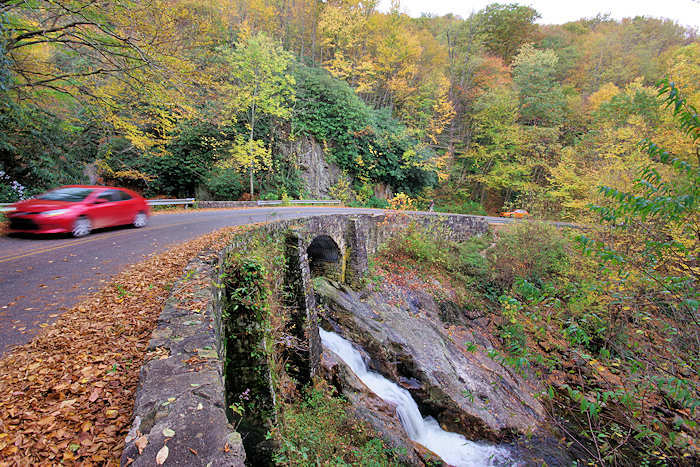 Continue toward the Blue Ridge Parkway and beyond on NC 215 for Dill Falls, Wildcat Falls and Sunburst Falls. 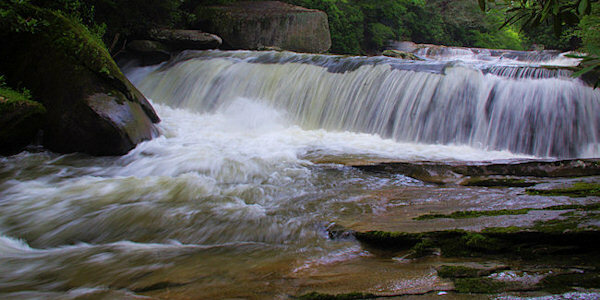 12 miles south (near Highway 64) is Eastatoe Falls. 18 miles away is Rainbow Falls and Gorges State Park. It's 30 miles to the DuPont State Forest waterfalls. 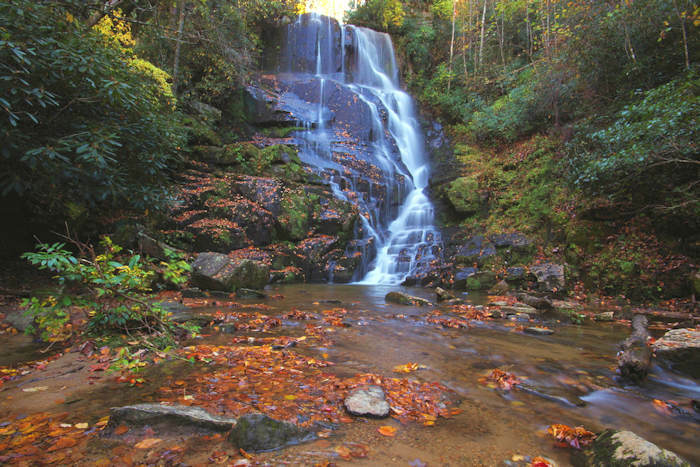 Also, see the Panthertown Valley waterfalls.